The Pump House, located in Moncton, New Brunswick, poured its first beer on Sept. 3, 1999 at 4 p.m. Since then, owners Shaun and Lilia Fraser, have received many awards and accolades while working hard to keep the brewery and namesake Pump House Restaurant moving forward and ever-expanding. Why the name Pump House? Well, it’s a question many people ask and has to do with the fact Shaun is a full-time fireman at the Moncton Fire Department. Made with Pumhouse craft beer and grapefruit juice. 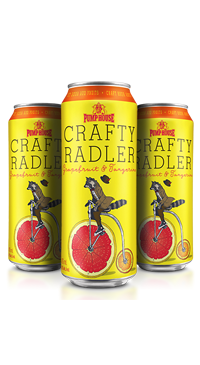 The term Radler means “cyclist” in German, where the popularity of cycling and the need for a post ride refreshment spawned the idea mixing beer and fruit juice. Citrusy and refreshing; perfect for cooling down this summer. 4.7% ABV. This is by far the best radler we have ever tasted! !